Bermuda Bound with Our Gang!! "King of the World"... me taking my turn at Voyager's Bow! The cruise began on Sunday (a gorgeous sunny day!) 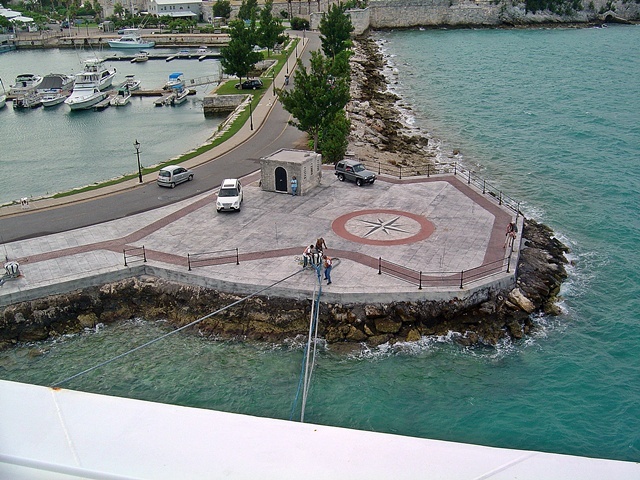 with early arrivals at Cape Liberty and immediate embarkation onto Voyager at 12:30pm and lunch in the Windjammer. We were all in our cabins by 1pm, and we already got our reservation in for Portofino's for 8 on Monday night, to boot! The best part of any departure from Bayonne is the fantastic view passing under the Verrazano Bridge shortly after getting under way. Be sure to be on the top deck. 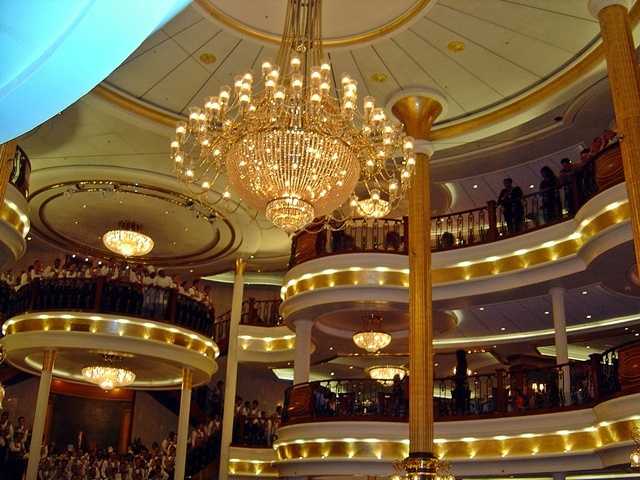 We spent an incredible night dancing in the ship's great nightclub! 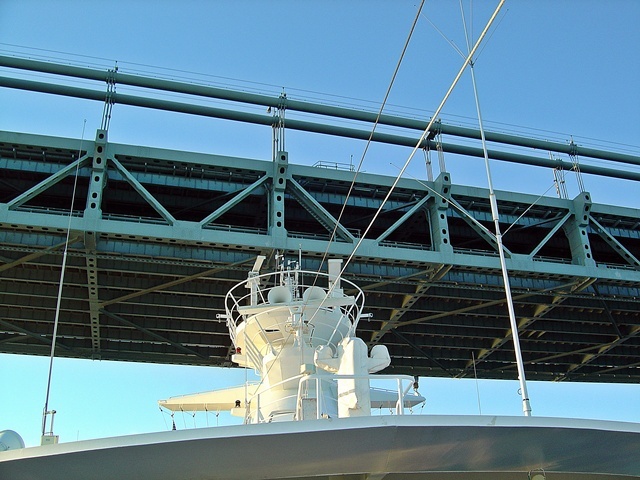 Voyager clears the Verrazano Bridge... you may now breath again! 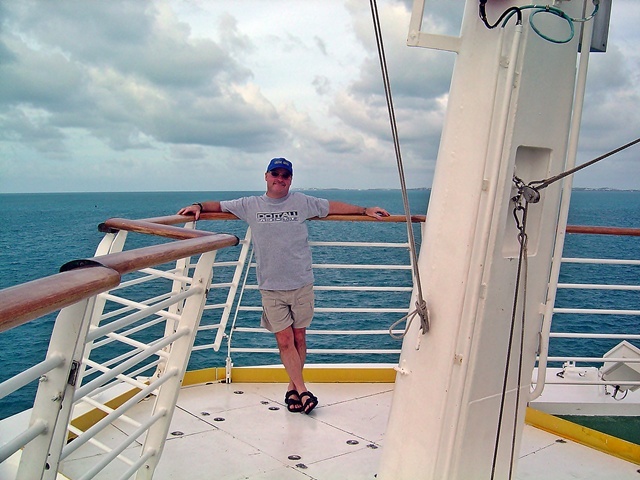 On our first day at Sea, the seas were very choppy and rough... even the awesome Voyager was tossed about. For me, it's a fun ride, but many aboard were obviously sick since most areas were deserted. One of our group was as well, but a quick trip to the ship's doc patched up her problems within an hour! 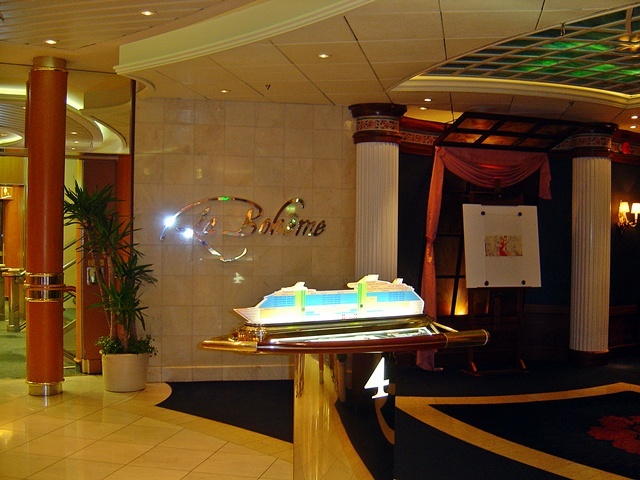 We all had fun around the ship, and at night we all had a sumptuous meal at Portofino's... still one of the finest dining experiences at sea! We all went and saw the hilarious comedian (Rick Starr?) at midnight... great show! 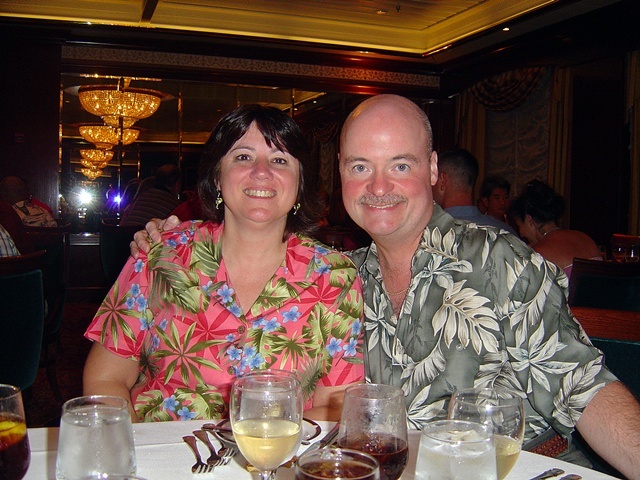 Not sure, but I think this is the night I actually played cards in the Card Room of any cruise! Geez, I was THAT drunk. Tuesday began mostly cloudy, and we'd been warned by the Captain that hurricane Nate was looking ominous for Bermuda- so we were ordered to all get back to the ship by 5:30pm when he would announce the decision as to whether we'd leave that night, or stay as planned through Wednesday. A few weeks earlier, Voyager was forced to divert the cruise to Canada due to another storm threat. 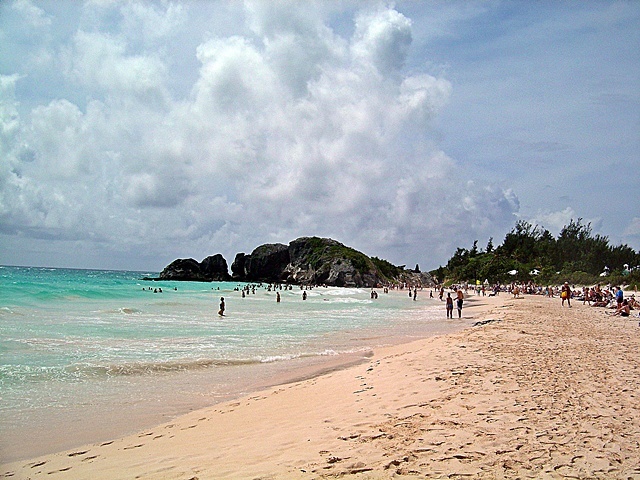 So I was happy just to be getting one day in Bermuda... especially since we'd never been. We all got off the ship and down to Horseshoe beach by 12:30-1:00pm and we had an incredible time! Not only was the surf really kicking but the Sun was out and the threat of any storm looked remote. 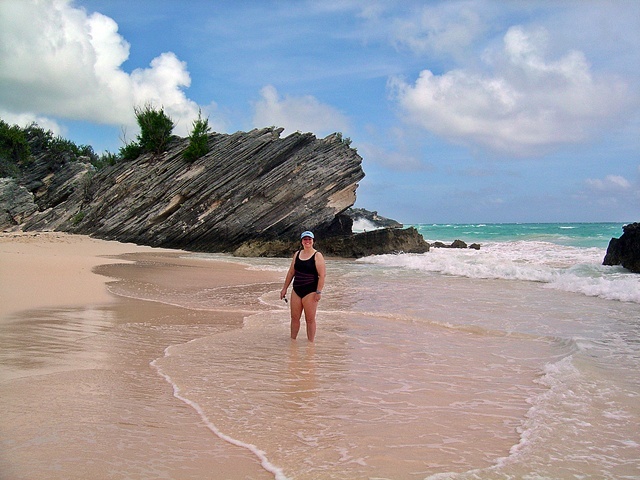 Looking in the opposite direction on Horseshoe Bay Beach... yes, pink sand! The beach here IS NOT TO BE MISSED! It's rock formations at both end are boundaries you want to cross through and explore... especially going east! The tide pools, and coves beyond and shards of (lava?) rock are just breathtaking. If you go to this beach and miss these areas, you've missed a lot! 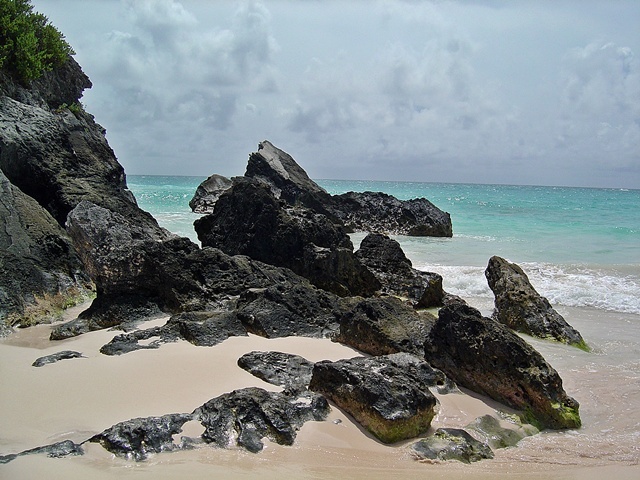 Rocky outcroppings at Horseshoe Bay! We returned to the ship around 4pm, and indeed, the skies were starting to look bad. After grabbing some snacks (late dinner seating, don't you know...) we headed forward to the empty bow and watched as things got uglier. 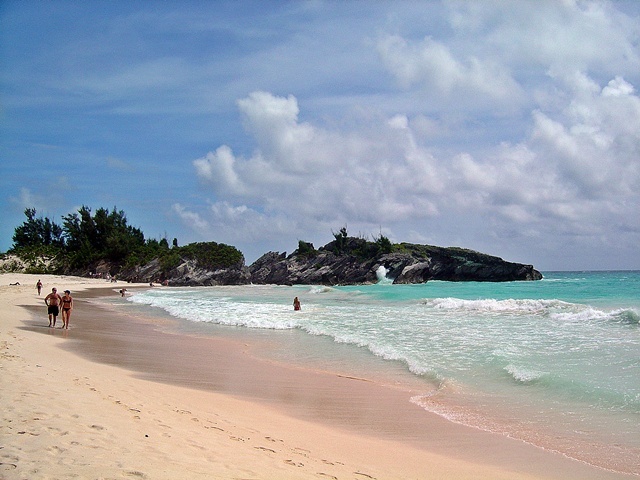 Sure enough, the decision was (wisely) made to leave Bermuda after 6pm (and of course, some passengers were still late- ugh!). 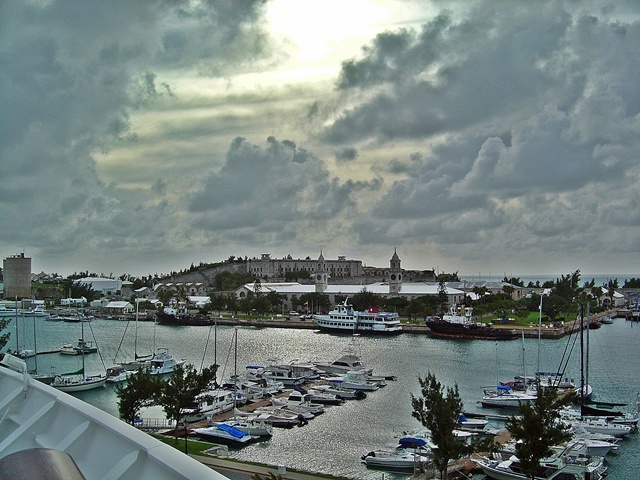 Ugly hurricane clouds brewing at King's Wharf, Bermuda... it's time to GO! Dock workers release the Voyager... so we can get away before the storm hits! Dinner was LOBSTER NIGHT and the lobster was outstanding!!! That night, the seas and winds were rough again, but we still made the best of it, heading to the Viking Crown for some latin music (I was the one looking confused on the dance floor!). We even headed for the hot tubs at the main pool (although the pools were emptied during the roughest winds and rocking so some blockhead wouldn't get knocked out, there was always a hot tub ready somewhere) in the wee hours of the morning! Wednesday, now an additional day at sea, proved the Captain's wisdom in withdrawing from Bermuda when he did as the seas north of the island were rough and tumble most of the day. 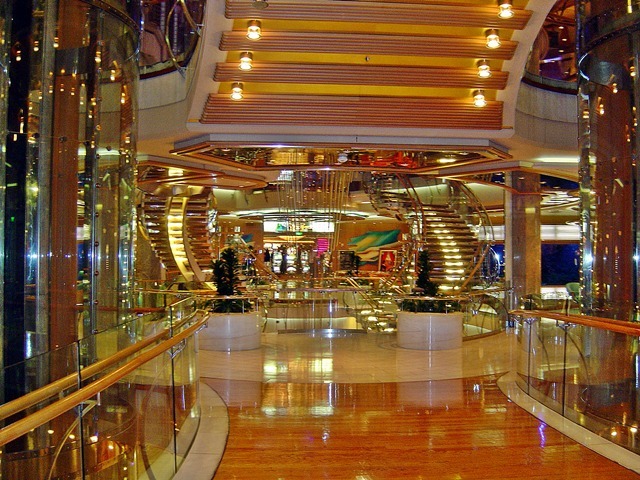 Still, we took in many of Voyager's fun places (the casino deposits among them) and had a ball. Something's always going on on a cruise. That night we retired to Cleopatra's Needle for a rockin' thru the ages party and danced. 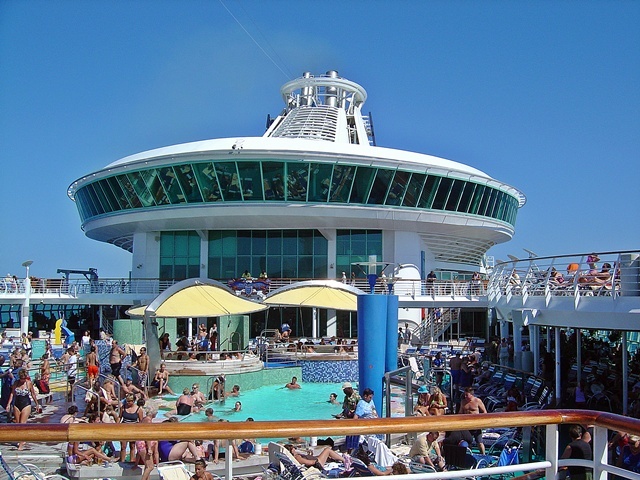 A wonderful day at sea, poolside! Friday- disembarkation couldn't have been smoother... off the ship, picked up the luggage and on our way back home by 9:45am. We arrived back home around 11:15am! Now that's cruising!!! Oh you lucky souls who live close to cruise ports in Florida... so many to choose from. To see more photos from this terrific cruise, press HERE!